Item # 314247 Stash Points: 5,495 (?) This is the number of points you get in The Zumiez Stash for purchasing this item. Stash points are redeemable for exclusive rewards only available to Zumiez Stash members. To redeem your points check out the rewards catalog on thestash.zumiez.com. Tear up the streets or park like the mighty "T. Puds" on his pro model Thank You Pudwill Rari Nights 8.0" Skateboard Deck. Slight concave creates a classic feel and stable landings while the small wheel wells help avoid wheel bite. Short and mild kick tails are added as well for quick pop, ideal for tight spaces and technical sections. Pudwill Rari Nights 8.0" Skateboard Deck from Thank You Skateboards. 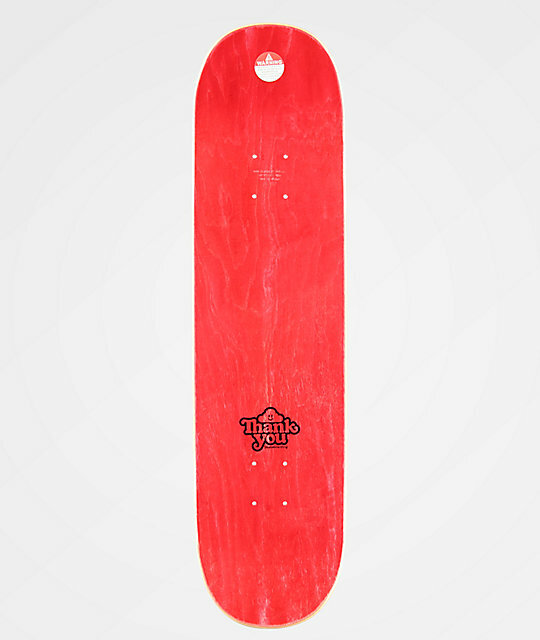 Official Torey Pudwill pro model. Wide, short and mild pitched kick tails.